Vatican City, May 28, 2018 / 10:05 am (CNA/EWTN News).- Ideologies which do not acknowledge and uphold the dignity of human life must be resisted and the Catholic Church’s teaching on life affirmed, Pope Francis told a group of Catholic doctors Monday. “The Church is for life, and her concern is that nothing is against life in the reality of a concrete existence, however weak or defenseless, even if not developed or not advanced,” the pope said May 28 in the Vatican’s papal hall. Doctors “are called to affirm the centrality of the patient as a person and his dignity with his inalienable rights, primarily the right to life,” he said. Pope Francis spoke with members of the International Federation of Associations of Catholic Physicians ahead of a congress on the theme of “Holiness of life and the medical profession, from Humanae vitae to Laudato si’” in Zagreb, Croatia May 30-June 2. Francis noted that the health and medical fields are a part of the advance of the “technocratic cultural paradigm,” which adores human power without limits and makes everything irrelevant if it does not serve a person’s own interests. “Be more and more aware that today it is necessary and urgent that the action of the Catholic physician presents itself with an unmistakable clarity on the level of personal and associative testimony,” he urged. He also encouraged working together with professionals of other religious convictions who also recognize the dignity of the human person, and with priests and religious who work in the healthcare field. Pope Francis asked for doctors not to forget that a patient is a human being. He told them not to get carried away by trends that only look at the expense of care, rather than healing people and defending life. 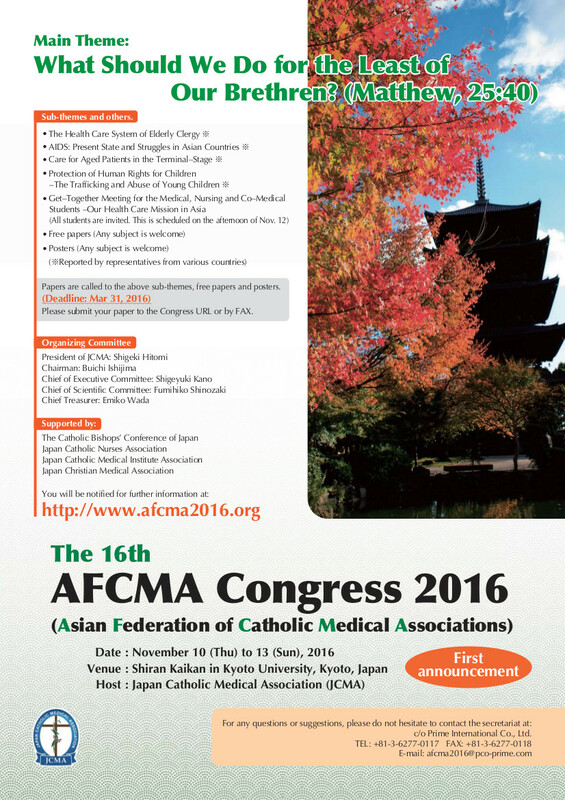 The International Federation of Catholic Medical Associations is made up of more than 50 associations from 66 countries, mostly from Europe and Asia. Its objective is to prepare Catholic doctors to correctly deal with complex ethical cases. It was instituted in France in 1884, in response to the message Leo XIII delivered in his encyclical Humanum Genus. In it, the pope condemned the philosophical and moral relativism proposed by Freemasonry.